Holistic Blend My Healthy Pet treats are low in fat and high in flavour. Feel good giving them to your dog, knowing there are no artificial flavours, colours, preservatives or additives. Ingredients: Oat Flour, Barley Flour, Peanut Butter, Apple sauce, Honey, Sunflower Oil (with Vitamin E and Rosemary as a preservative). My boyfriends dog loves these, and I love that theyâ€™re a healthy treat. I got them when they were on sale and they were a good value. I would repurchase. my little dog enjoys these treats and she tends to be a bit finicky so i know these will continue to be on hand and available for her. It is very easy to break them up into smaller pieces for her to enjoy. A great product that our dog loves. 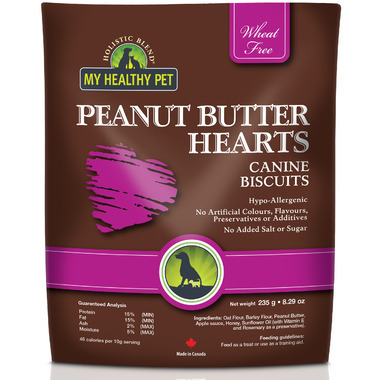 It was important for us to find something of a non-meat alternative for a treat as our dog has renal issues and metabolizing protein is a problem. This is a perfect treat and he loves these. My puppy loved them and I loved that they were all natural!